I'll bet they sold tons. This is the most incongruous pairing I've ever seen. Edixas were West-German cameras made by Wirgin, a mid-tier brand, and they had that polished German look. Gabby was famous as the goofy sidekick in Westerns from the 30s and 40s for the likes of Hopalong Cassidy, Roy Rogers and Gene Autry. Seems to me he'd be more at home with a Kodak Pony or an Argus C3. 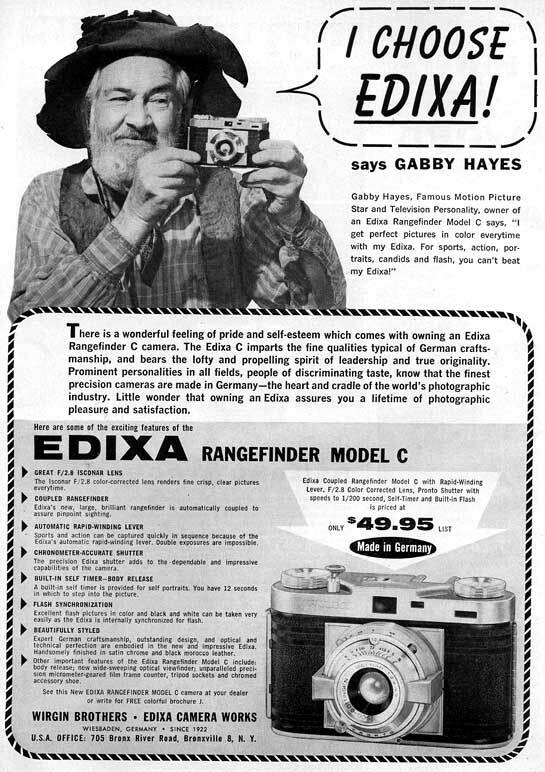 You don't see many celebrity endorsements for cameras, at least not in camera magazines. Most come from professionals.